Sapona Plastics will strive for total elimination of waste. The Lean Transformation began in January 2010 with training provided by Randolph Community College and Solomon Engineering and Operations Solutions. All employees have been trained in lean principles. •Autonomation - including Mistake proofing, Stop and fix, separating human work and machine work, visual management and quality at every step. •Just-in-time - including Quick changeover, 5S workplace organization, Productive maintenance, planning, continuous flow and pull production. Lean depends on employee involvement. First line supervisors are identified as champions and have been provided Lean Pocket Guides. Sort - Keep only what is needed in your area. Standardize - Develop system to maintain what has been done. Sustain - Self discipline to maintain established procedures. ​Other areas of focus have been work cells, setup time reduction and value stream mapping. Sapona’s management information system has been customized to integrate lean concepts. Optimal levels of finished goods and work in process inventories are determined and monitored. Matching production to demand is achieved in one case by integrating daily parts usage data from customer plants. Work orders indicate production output standards every 2 hours. Sapona draws some of it’s concepts from the book Factory Physics, We carry finished goods stock inventory to ship immediately in many cases and schedule to replenish stock based on actual demand and economic production quantities. Our approach uses the CONWIP concept instead of simply JIT. Our goal is on time delivery of what the customer needs when they need it, on time at least 95% of the time. We strive for continuous improvement in all areas. In our system we establish a current constant work in process inventory level and then attempt to reduce or optimize that level through continuous improvement. In addition, we establish a safety stock level of finished goods inventory to achieve >95% on time delivery. Within our system for each item we measure our lead time, effective parts per hour, variation of output, total lead time, setup time, finished inventory, work in process hours and annual/monthly/weekly demand. We attempt to optimize these values through continuous improvement. Shipments of product to customers pulls production through our system, but we also consider customer orders and due dates that have a tendency to push into our system. We have a mix of products, some that are stocked in inventory and some that are strictly make to order. Some with seasonal demand that require production to start well ahead of the peak season. When uneven demand or customers desire stock inventory then the true lead time increases, but on time delivery can be improved. It is especially important in these cases for customers to advise us as early as possible when design changes, promotions, or end of life events are expected to happen. Some customers place blanket orders well in advance of need and pull the product weekly, while others simply call today for product to ship today. Within these extremes we can measure order lead time, but it is really related to the relationship with that customer. 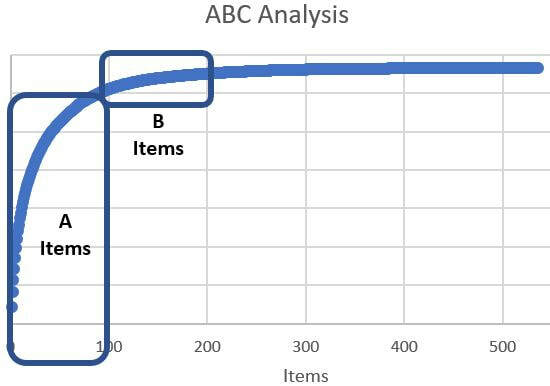 Our inventory includes ABC classifications of items based on throughput value. A items have much higher inventory turns that B and C items. This draws attention to the critical few and not the trivial many. We measure throughput in terms of value added dollars shipped. We focus on throughput out the door and strive to match production (value added produced) to that number so that finished goods inventory does not increase unexpectedly. That way higher raw material costs don't skew the measure. We measure the total value added each day which we refer to as yield, as well as the yield value generated per hour at the plantwide, customer, product and machine level. Here are summaries of some of our lean activities. Business Case: Thick plastic wall section required for brush bristles leads to cooling the plastic in a chilled water bath for 5 minutes after molding. Putting the parts in and taking out of the water is done by an operator and is subject to variations that can affect part quality. Workers typically don't like working around the water bath. This product is high volume and justifies automation with robotics due to the potential labor savings. Data: A small level of rejects results from operator inattention and interruptions. Action Plan: Utilize water submerged conveyor and feed it with part removal robot. Parts stay submerged to end of conveyor bath and dump into skid size tote. Deliver the runner waste directly to the grinder each shot. Install dumper at brush machine to ease access to parts in tote. Include flexibility for multiple parts configurations. Challenges: Programming of controls to interact with robot and conveyor. Parts float so a means of keeping the parts submerged to be developed. ​Results: Conveyor equipment developed in house and installed. Works great. Product much more consistent with no rejects for cooling issues. Business Case: Files of checks matched with receivers and invoices are being filed by supplier but rarely accessed. Wastes time filing, wastes time looking for specific document, wastes space for filing cabinets, not easy to search. At the time we are reorganizing accounting from an offsite central office to local processing. At the same time the lease is up on the old copier and the new copier has OCR filing capabilities. Action Plan: Set up remote terminal server access to software. Program the new Kyocera TaskAlfa copier to scan signed bill of ladings and matched checks+invoices+receivers using OCR to file bill of lading number or by supplier name for easy search and access of pdf. Results: Program requirements designed with examples provided to Kyocera who programmed the copier software to process the paperwork in batches and create descriptive file names that are easily searched in Windows 10 software. Stored on our server and backed up online. Next Steps: improve access to stored files by accountant controller. Business Case: Brush making is 20% of our business and requires shipping an ever changing mix of a limited number of products each week. Originally, when we purchased this product line, inventory was kept between each stage of the process. Inventory is difficult to manage, slows change capability, requires excess transportation and handling and requires investment. Packing even being done offsite by contract vendor. Action Plan: Develop a work cell including the brush making, riveting, padding and packing to eliminate work in process inventory between stations. Make it flexible so any of the products can be produced with little changeover time. Provide alternate lines so if one line breaks down, another can increase output with the available resources. Create a new lighted and air conditioned space specifically for brush making with new more efficient layout design. Challenges: Older equipment breaks down frequently. In a cell environment the breakdowns would idle everyone on the line which seems inefficient. Results: Inventory was immediately reduced significantly. As the improvements progressed an opportunity to buy a new machine became feasible. The new machine was less highly automated but allowed for faster changeovers so the cell can react quickly to retail orders that have only a few days lead time. Subsequent Step: Implement production monitoring system from Ampogee to improve worker involvement in improving output productivity. Implemented. An additional machine came available on the used market that is highly automated. It is focused on the single highest volume product and has no changeovers. Subsequent improvements: Move operation to new plant to allow space for better organization. Include with a new and different product line sharing resources. Implemented. Next: Install visual monitoring screen. Business Case: Quality planning is critical to successful projects and there are many steps to maintain compliance and make sure we take every risk into account. Action Plan: Create a simple one page checklist to make sure the complex process steps are all completed satisfactorily for each new product. Business Case: New energy efficient lighting was leased 6 years ago that resulted in $1000 per month energy savings. Now the bulbs are burning out and we are faced with extensive maintenance time on the production floor over an unknown time to replace bulbs plus the cost of the bulbs. Action Plan: Replace with new LED lights in the existing fixtures that will last for 10 years and be very low maintenance. Contract with Greentech to install. Get rebate from Randolph Electric. Challenges: Make sure the color and light level is not negatively affected. Many lights hang over molding machines so a boom lift is required to be rented. Results: Lights installed and no complaints. Very satisfied.